•	Data center – a centralized repository for the computers and equipment that manage a companys critical applications. 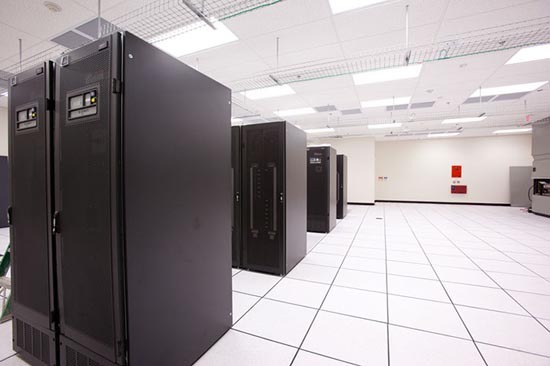 •	Networking operation Center (NOC) – a room designed for monitoring and maintaining data center equipment. This is the area where employees supervise server activity, web traffic, network performance, software distribution and related activities. •	The Energy Plant – A section of the facility rpoviding the power and cooling infactstructure to support the data center and Networking Operation Center hardware. Mission Critical facilities run day and night and thus, they cannot afford downtime. Mission critical facilities must continue to run, even if an element of the facility needs repair. The mission critical facility cannot stop operating just because one element fails or needs to be repaired. When designing a mission critical facility flexibility is very important. A mission critical facility must be able to adapt to any future changes or needs. Anticipating these potential needs, whether power, capacity or security can be the difference between a well functioning mission critical facility and a major failure of the system. You must also ensure that your mission critical facility is being constantly maintained so that any potential problems can be anticipated and avoided. Mission critical facilities run on a lot of power, have extreme energy needs and these needs must be able to be met or you could face a system failure. In such a facility, you need to maintain energy efficiency without compromising energy effectiveness and reliability. As more businesses move to running internet companies, more and more businesses are becoming reliant on their data centers and mission critical facilities to ensure that business runs as needed so that revenue is not lost. With zero disruption to the system being the goal, the design of a mission critical facility is crucial. Potential problems and risks must be anticipated and mitigated. The cost of even a short downtime to a mission critical facility can be hundreds of thousands, even millions of dollars. With such high stakes every precaution needs to be taken so that a mission critical facility can continue to run as it has been designed to. This entry was posted in Mission Critical Industry, Titan Power and tagged Mission Critical. Bookmark the permalink.